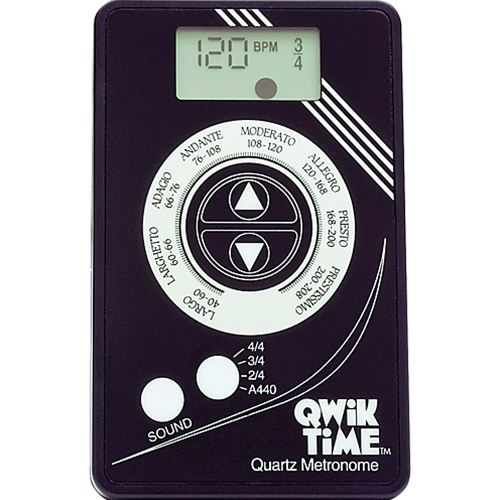 Packed with professional features, the QT5 offers functions not seen on metronomes that cost twice the price. Credit card-sized, it features over 200 tempo settings, distinctive click sound, A440 tuning tone, and low-battery indicator. A very small metronome, it will fit in your pocket or any instrument case. Size: 2"W x 3"H x 1/4"D. The screen displays the tempo with a black dot that swings from side to side with the beat and shows accenting of the beats on 2/4, 3/4, and 4/4. Tempos can be chosen from 40 to 250BPM in one-beat increments. The sound is a beep that can be turned off. The metronome is held upright with a stand that swings out from the back. Tempo markings are on the face. Watch-type battery and an instruction sheet are included. One year warranty.